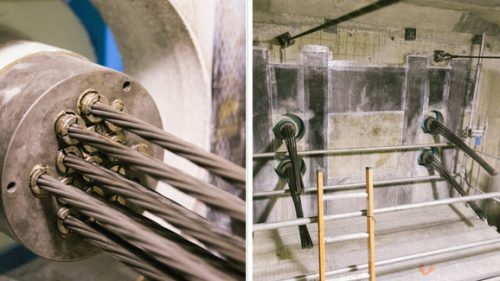 Sound Transit announced on Wednesday that construction crews are nearly done with their work retrofitting the I-90 bridge for East Link. Crews have worked for more than a year to post-tension the bridge’s pontoons. ST reinforced the bridge to help it carry the load of Link’s tracks, overhead lines, and vehicles. 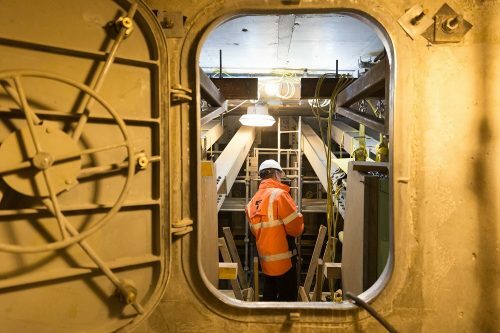 The retrofit also improves the integrity of the bridge in heavy wind and an attendant storm surge, the likes of which sank the eastbound span in 1990. Giant steel structures, called reaction frames, anchor the new cables at both ends. They absorb the force from winching the steel cables, and whatever event that might stress the structure. Each of the ten reaction frames weigh about 17,500 pounds. The structural work is finished. Crews are removing equipment from the pontoons and grouting the housing of the cables, to prevent water corrosion. After that work is done, construction of the guideway can start. Maybe they meant pounds per square inch (PSI)? Since yes pounds is not a measurement of pressure. They likely meant “pounds of force”, which is generally how tension is measured (or Newtons in metric). In layman terms, force and pressure can mean the same thing. Many thanks for this one, Peter. At this point in the building of our regional transit system, should be at least three postings a week on structures and machinery, and their operations, and the training required. So everybody discussing, and advocating for transit can start seeing of every statistic as a gauge-reading on a control-board.We need to be able to identify and trace a burning statistic before the smoke gets in the window at The Seattle Times. Wonder if the Seattle Room- archives, Downtown library tenth floor, has any of the reports on what happened here. And also, legal defense. Good thing about floating bridges, though…try to float in and reattach The Golden Gate. Especially if it had East Link attached to it. Bay Bridge was hard enough. Austrian accent- if somebody with an ST hard-hat chairs the event.